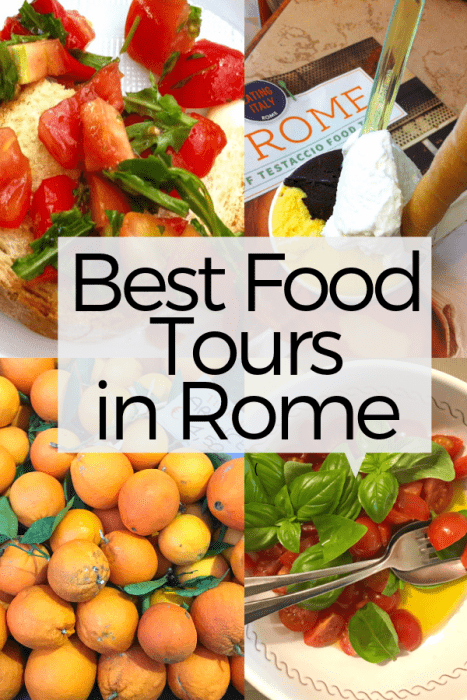 Looking for the best food tours in Rome? Trying to decide which one to take? 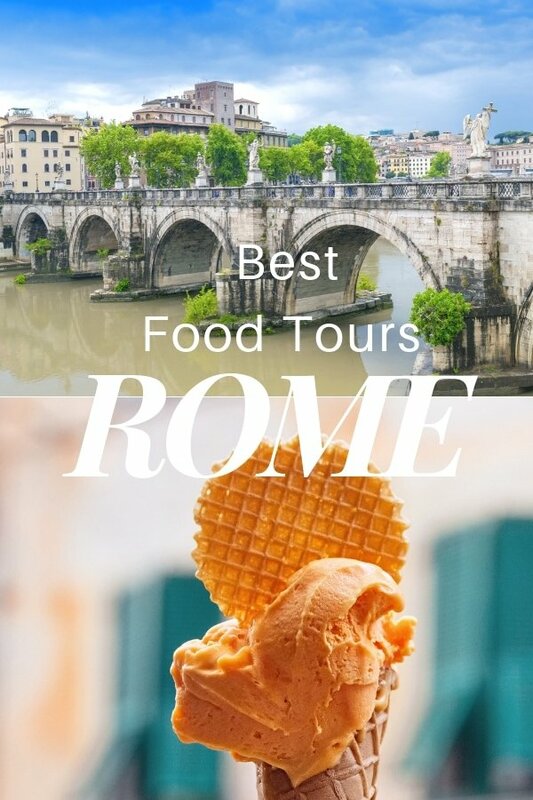 Scroll down for details on Rome’s best food tours and instructions on how to get a special 15% discount on all Eating Europe tours in Italy. 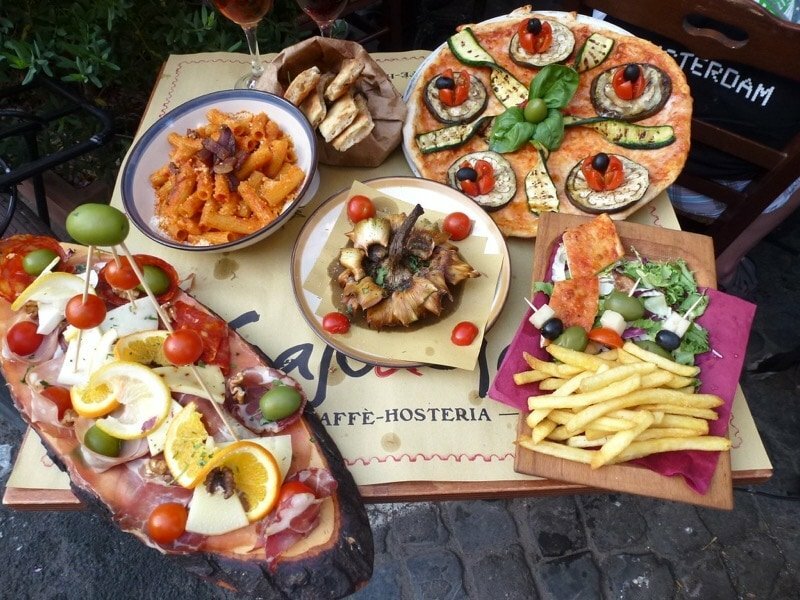 If you really want to soak up the atmosphere of Rome, you need to get away from the touristy areas and eat like a local. 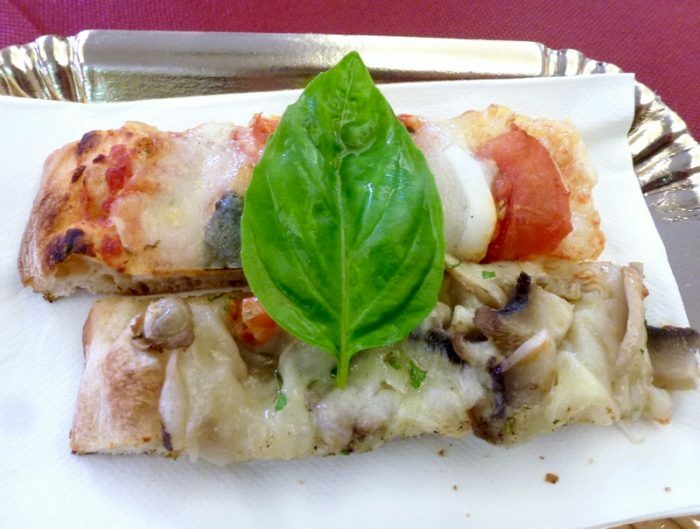 I’ve taken two food walking tours in Rome with Eating Europe. They’re among the top-rated food tours in Rome and, while I enjoyed them both, they’re quite different from each other. 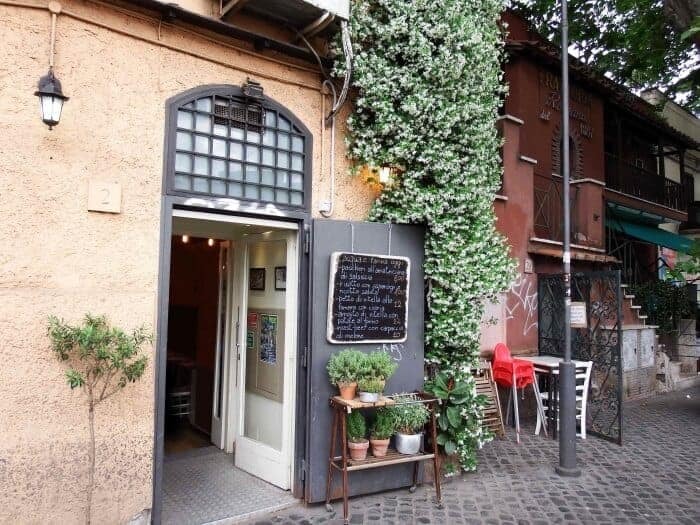 In this post, I’ll provide details on both the Taste of Testaccio walking tour of a historic, working class neighbourhood and the Twilight Trastevere Food Tour, an exploration of a trendy neighbourhood filled with small restaurants and bars. Are Food Tours in Rome Worth It? Why should you take a food tour in Rome? While you definitely don’t want to miss visiting Rome’s top attractions such as the Colosseum, the Trevi Fountain, Spanish Steps and other bucket-list sights (be sure to read our post on the 3 Mistakes You Don’t Want to Make in Rome), to really get a taste of Roman culture, you need to take a food tour. The best food tours combine history and cuisine into one memorable and tasty experience. They also offer insights into what it’s like to live in Rome, how locals shop for food, where they enjoy their morning coffee and where they hangout at the end of the day. 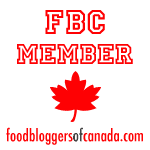 A guided food tour also offers insights into the ingredients themselves. Sure you could pop into a cheese shop in Rome on your own but if you don’t speak Italian or have an in-depth knowledge of Italian food, you’ll just be looking at ingredients without any understanding of how they’re sourced, made or enjoyed in Roman culture. The best food tours also offer access to experiences you’re not able to get on your own – special dishes not listed on the menu, insights not available in guidebooks, introductions to producers and shopkeepers as well as insider access to unique experiences. Are they worth the money? You’ll enjoy so much to eat on the Eating Europe food tours you can actually skip lunch or dinner, so that will save you money. Plus, unlike some other food tours in Rome, all of Eating Europe’s tours are all-inclusive which means you don’t pay extra for the wine, beer, cocktails or spirits included as part of the tour. 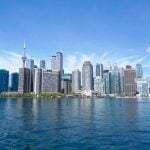 And, if you sign up for the A Taste for Travel newsletter, you’ll get access to special subscriber discount, including a 15% discount on all Eating Europe food tours – the best of both worlds. Here are the details about the Taste of Testaccio, offered by Eating Europe Food Tours and Eating Italy. This 4-hour tour is one of our favourite walking food tours in Italy. 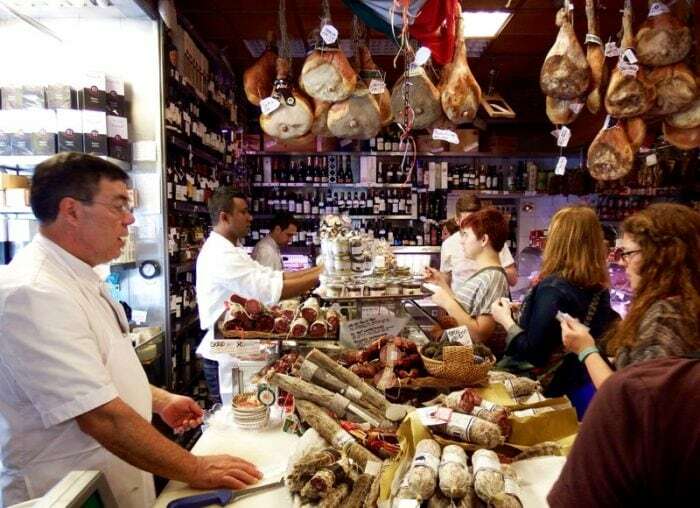 The Taste of Testaccio food tour by Eating Italy Food Tours features a 4-hour walking tour through one of Rome’s oldest and most interesting neighbourhoods. It features nine stops and 12 food tastings. Along the way you’ll see and experience the cultural, historic and archeological highlights of the Testaccio neighbourhood, known for its real, authentic, working class Roman vibe. It takes participants away from the crowds and off the beaten path into the relatively under-the-radar, working class neighbourhood of Testaccio in southeast Rome. Wrapped by the Tiber River and home to the Aventine Hill, the most southern of ancient Rome’s seven hills, it was once home to the vegetable gardens of Popolo Romano (Meadows of the People) and Europe’s largest slaughterhouse (now closed and converted into a cultural space). Testaccio is actually built around the Monte dei Cocci, a hill created of discarded ancient Roman amphorae or terracotta jars. Caves have been carved into the hill’s slopes, many of which have been converted into atmospheric bars, nightclubs and cafes. You’ll get to enjoy lunch inside the cool interior of one of the cave restaurants during the Taste of Testaccio tour! The experience began with espresso and cornetti (sweet pastry) at Barberini cafe/bar, then we dove into the taste sensations within several slices of Rome’s top-rated pizza, followed by the opportunity to create our own bruschetta in the Testaccio Market. We also sampled cheese in the “Prada” of cheese shops, lunched in an ancient cave made of amphora pottery and learned the secrets to identifying real gelato. Along the way, we met the owners of family-run businesses and Italian restaurants, lots of food producers and passionate chefs. The concept of this wonderful experience was to wander Rome like a local and get a feel for living in Italy through their rich culture and by sampling some great Italian cuisine, at least for a few hours! Not only were we completely inspired by the stories of the people we met (one couple even offered tips on the secrets to a long-lasting marriage) but we were so stuffed with gourmet food we walked all the way back to the Spanish Steps and didn’t eat for the rest of the day. Well, not counting gelato! Later that week, we followed our guide’s suggestions (and the Eating Italy Food Tour recommendations on their handout at the end of the tour) for great Rome restaurants. We weren’t disappointed and enjoyed one of our best meals in Italy! I enjoyed my Taste of Testaccio tour so much, the next time I was in Rome, I signed up for the Twilight Trastavere . It was equally enjoyable and I was travelling solo so was looking for something to do in the evening. It fit the bill perfectly. Highlights of this walking tour of Rome’s most bohemian neighbourhood included tasting wine in the Spirito di Vino’s wine cellar, an underground grotto that’s 150 years older than the Colosseum. Another memorable stop during the Twilight Trastavere Tour was Da Enzo al 29. This award-winning restaurant is well known for its excellent regional cuisine and its line-ups, but we breezed right in. Our tasting at Da Enzo was carciofo alla giudia, artichokes served Jewish style, a crispy fried globe artichoke, a dish traditionally served to celebrate the end of the Yom Kipper fast but popular in the historic heart of Rome. Fried twice in oil, sprinkled with sea salt and served upside down like giant inverted sunflowers, these artichokes were quite possible the best thing I’d eaten all month. Our group demolished them in record time. As we meandered our way through the laneways of Trastavere, we sampled cookies at a family-run bakery, dived into bowls of cacio e pepe pasta served family-style and generally ate our way through this historic and bohemian neighbourhood. 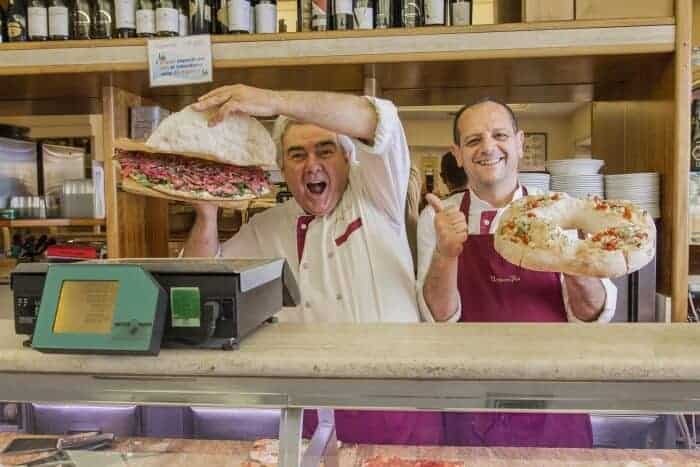 The main difference between the two tours is that the Taste of Testaccio tour features more specialty food shops, while the Twilight Trastavere food tour focuses on restaurants, wine shops and eateries. Another important difference is that Trastavere is a trendy neighbourhood filled with young people out bar-hopping while Testaccio is more of a working-class neighbourhood with fewer trendy spots. If you’re interested in exploring a food market in Rome, then you’ll want to see the Testaccio Market. It’s still very much a working market that caters to locals and is not at all touristy. There are slightly more sights and monuments in Testaccio. 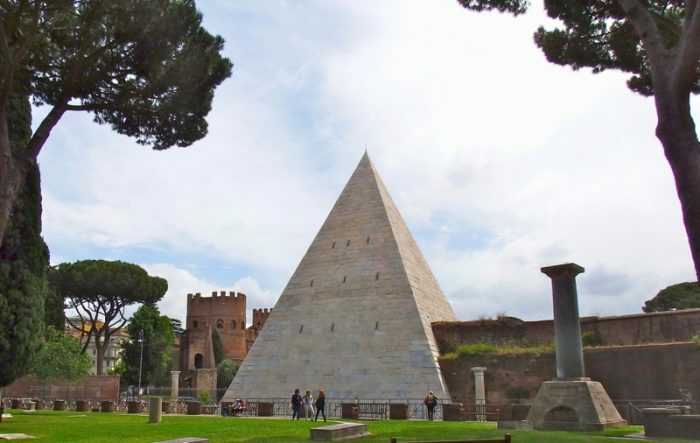 The walking tour includes the Monte dei Cocci made of amphora, the Pyramid of Cestius and a walk through the atmospheric Cimitero degli Inglesi (Englishmen’s Cemetery) home to the graves of the English romantic poets John Keats and Percy Bysshe Shelley. 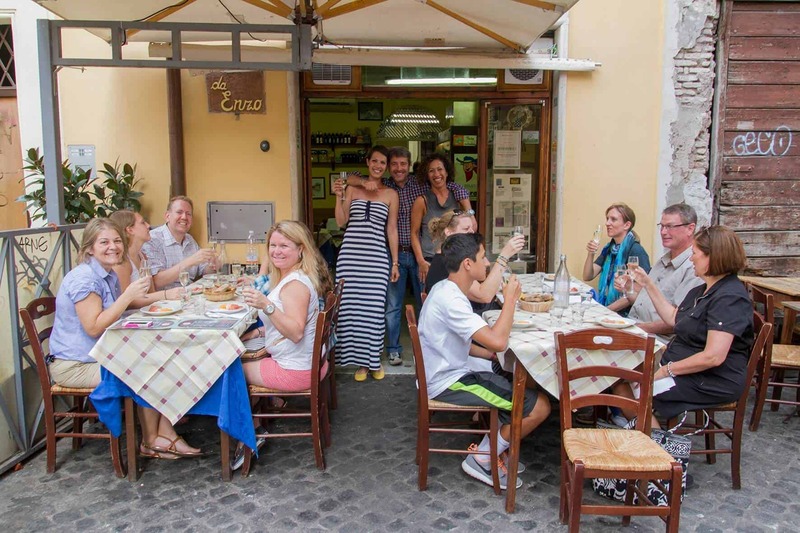 The culinary experiences you’ll enjoy on the Trastavere Tour are more upscale than those on the Testaccio Tour. The Trastavere neighbourhood is easier to explore independently as it’s closer to the heart of Rome but it’s also easier to get lost in due to the winding streets many of which are poorly marked. Having a local guide for your first visit really helps to get oriented. At €79 Euros vs €99 Euros, the Taste of Testaccio Tour costs slightly less than the Twilight Trastavere Tour. Our subscribers get 15% off those prices with the Special Eating Italy promo code so it’s an even better deal. 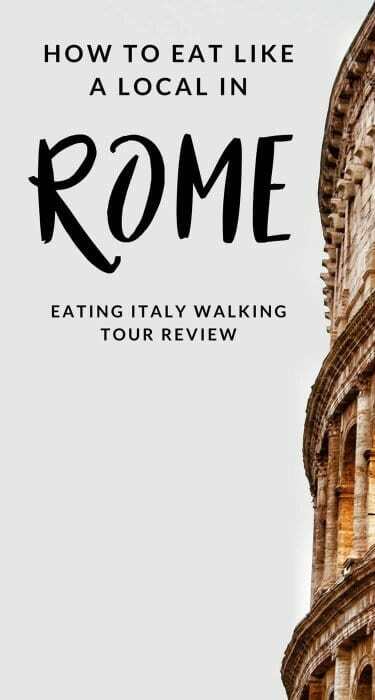 If you love food and you’re looking for the best food tours in Rome, you’ll be happy with either one of these Eating Europe culinary walking tours. 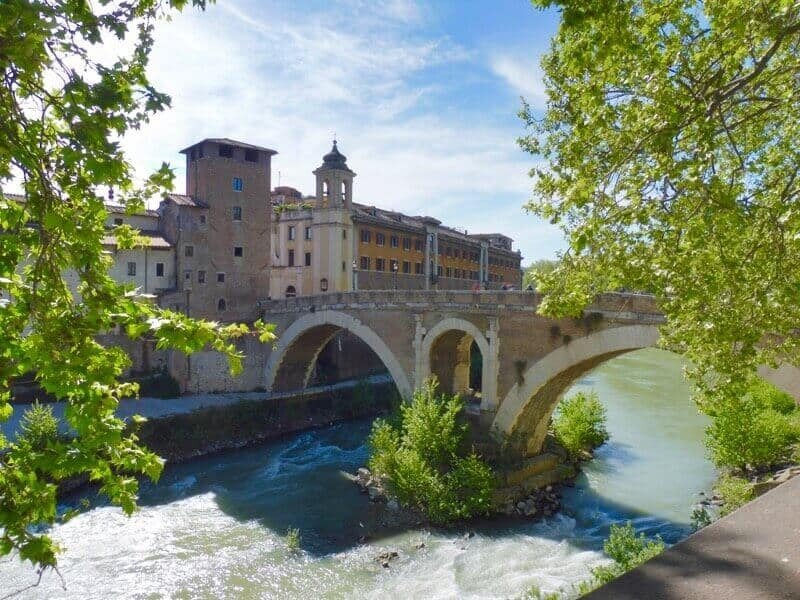 However, it you have time for only one tour, and are more interested in sightseeing and food markets, I recommend you take the Taste of Testaccio tour and then explore Trastavere independently. 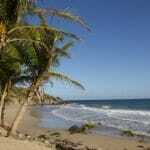 A Taste for Travel participates in affiliate advertising programs. Please read more on our Disclosure Page. How do you get the 15% discount code? There are two easy steps. 2. 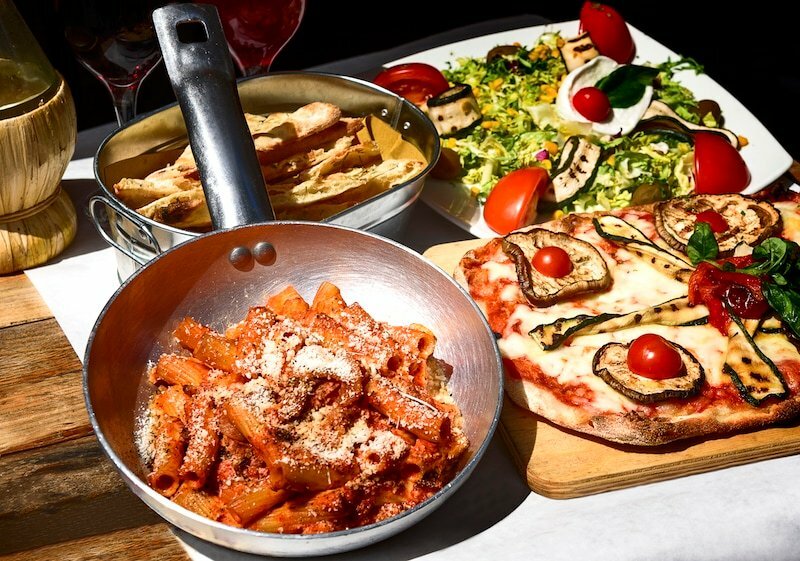 Once you receive your discount code on the Subscribers Resources Page, use your Eating Europe Taste of Testaccio Discount Code by clicking here. I suspect you’ll be hooked after your first tour with Eating Europe, so for the other days you’re in the Eternal City, why not try these other Eating Italy Tours in Rome? You can use your subscriber discount code for 15% off on any of these tours as well! Although Eating Europe’s food tours in Italy are especially popular, Eating Europe also offers food tours throughout Europe. Any one of their in-depth culinary walking tours is sure to be a highlight of visiting Amsterdam, London, Paris or Prague. Check out our blog post on the new Eating Europe London Food Tour. 2) Once you receive your special Subscribers Discount Code, click here to book all Eating Europe Food Tours / classes across Europe. OMG I miss Rome! Looks like Cafeteria Volpetti Piu knows how to put on a spread! What a fantastic concept. Nothing better than discovering a place as a local rather than a tourist. I love walking tours but I’ve never been on a food inspired one, although we did taste some things on a Laneways tour in Melbourne. I think it would be great to be taken to places that you might not have found by yourself. Love it, headed there in May and will need to check this out! Ohmigosh!! 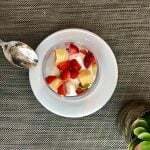 the food photos! the hanging hams! Looks like there’s much to eat in Rome that I missed. Next time I’ll definitely take a food tour.